Like Obama the leadership of Maricopa County Republican Committee is creating a divisive environment for PC’S to get along and move the party forward. A good leader creates a harmony among their worker bees, and doesn’t let their personal conflicts effect the group. This is grade school actions not grownups. GET OVER ALL OF THE BS AND LEAD. 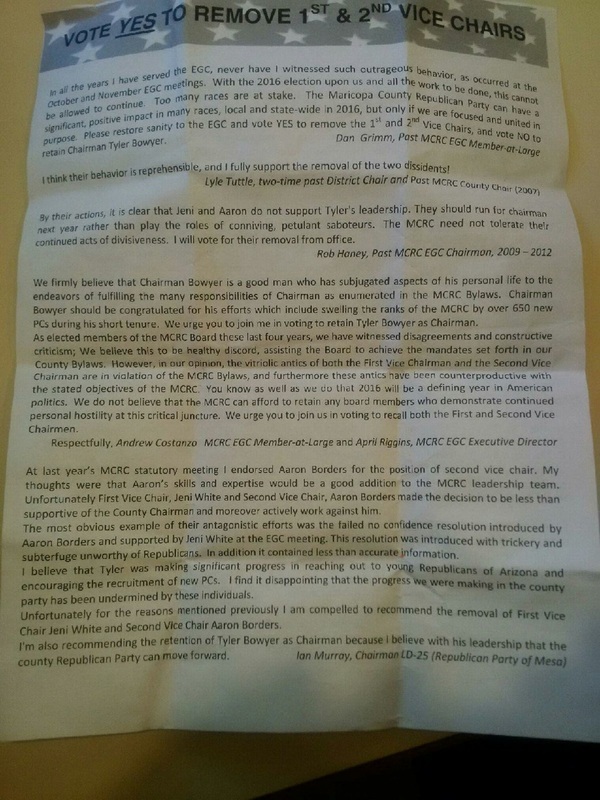 To me, this removal letter indicates collusion between Chairman Bowyer and certain individuals. How is it that these individuals had sufficient notice to prepare letters of support for the Chairman when I, and I would suppose many others, had no prior information? Is this the transparent leadership Maricopa County needs? Is this what we want? Further disturbing information has emerged after the packet stuffing party today. Attached is a two page letter prepared in advance and printed in several thousand copies advocating for the removal of Jeni and Aaron. This letter is now included in the Mandatory Meeting packet that all PCs will receive. To me this indicates that Chairman Bowyer shared the plans for this special meeting with these individuals prior to the call letters release and allowed them time to prepare these statements. Meanwhile we, the district chairs, were left in the dark. If you have not emailed me already to add your name to the pre-mentioned letter, in light of this information that points to Tyler's premeditated decision to intentionally leave us in the dark please let me know and I will add your name. I write to you as a frustrated chairman faced with yet again a need to answer confused inquiries from my PCs due to the actions of our county party leadership. Below you will find a letter I plan to send to my PCs regarding the surprise inclusion they found in their Mandatory Meeting call letter packet. I believe that many of you and your PCs are frustrated that yet again our chairman is acting unilaterally and not involving the district leadership. I believe it is appropriate and necessary that we as chairmen take the lead to reassure our PCs that they can have confidence in our leadership as district chairs despite the infighting of others. I feel a message showing a unified group of LD Chairs will go a long way to send this message to our PCs. So if you feel the same I ask that you respond to this email and I'll add your name to this letter. I have already expressed the below to Chairman Boyer but have not received a response. I write to you as your chairman and as one of several chairmen who are frustrated with the recent action of our county chairman Tyler Boyer. I understand that you were surprised to learn that your presence is being requested at a special meeting for the purpose of recalling officers of the county party. I also understand if you are frustrated that you are being asked to stay even later in the day after having performed your PC duties at the already lengthy Mandatory Meeting. I further understand if you are frustrated that you have not been provided any background information on why a special meeting has been called and provided very little time to research the issues you are asked to address. I want to offer you my apologies as your district leader. Unfortunately, our county chairmen decided not to share any of this information with us and we were forced to learn about it as you were. I want to apologize that you do not have a county chairman who has enough respect for your time to allow you additional time to plan to attend this meeting, even though he had a number of opportunities to let you know this was being planned. I also want to apologize that your county chairman does not respect you enough to provide any justification for this meeting or ample time to research the issues on which you will be asked to vote. 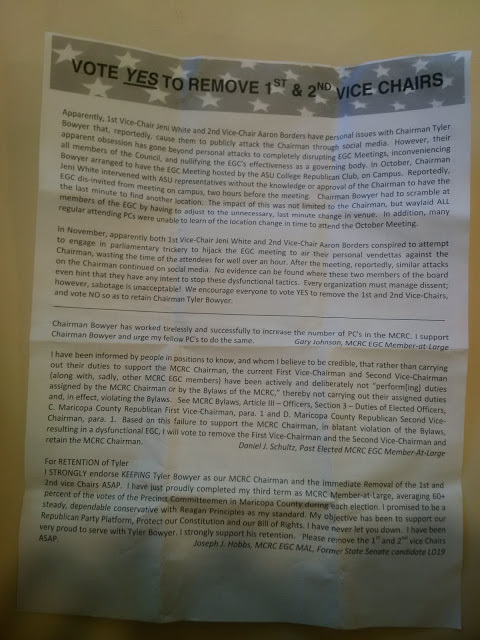 Please rest assured that despite this demonstration of exceedingly poor leadership on the part of the county chairman, your local district chairs are united to support you as PCs and patriots. We have asked the chairman to reconsider his unilateral executive action out of respect for you. Please reach out to me with any concerns and I will address them as best I can.